When you’re talking about bang for your buck, this is one of the best! Today’s game is POP IT! This game has two great elements going for it. It’s quick, so people don’t lose interest, and it’s hilarious to watch. In fact, sometimes watching students get the glove on their head is more fun than seeing them blow the glove up. I must say that I still have a video of me doing a test run in my office a few years ago- I look ridiculous! So get ready to have some fun and enjoy your day. You have probably seen someone do this before just for kicks, but why not turn it into a game. All you have to do is put a surgical glove over the heads of the contestants. Pull it down until it covers their nose (at no time should you cover their mouth and nose!!!) and wait until everyone is ready. The glove should be tight, but the participants may need to ensure that there are no loose spots where air can escape. Once they are ready, their goal is to make the glove explode by blowing it up with their nose! First one that pops wins! 1. 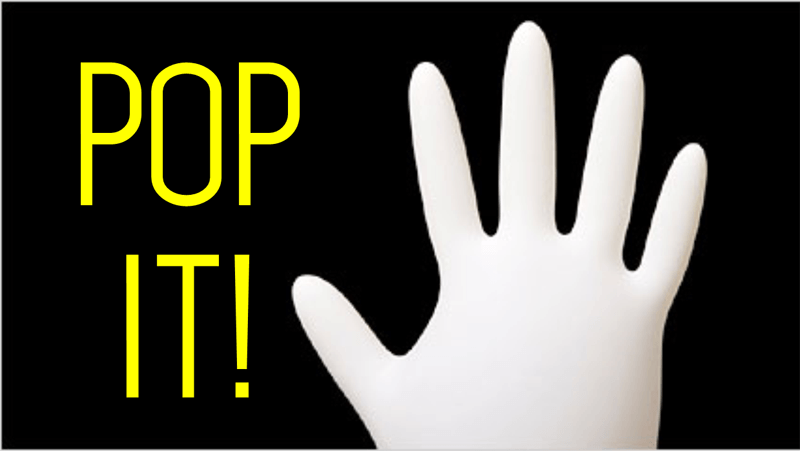 Make sure to use Large Size surgical gloves, or you run the risk of the glove tearing. Also, stretch the gloves before handing them to contestants so they go on their heads easier. 2. This game is a lot of fun, but make sure to have some back-up gloves just in case a few of them rip from being pulled too hard. 3. Have some people assist the contestants as they try to put the gloves on their heads. It might seem like they won’t fit, but trust me, they do!